Animated and electronic books are great resources for building and supporting literacy. Below is a short list of animated and electronic books in PBS LearningMedia. With thousands of videos, lesson plans and interactives, PBS LearningMedia is a great resource for media in the classroom. With a collection of over a hundred resources from Between the Lions, an award-winning PBS television series designed to foster literacy, students pre-k through 1st grade can follow along with text on the screen while listening to a narrator read aloud from these three favorite stories. Abiyoyo This classic is a tale of a father and son who are ostracized from their town, but end up heros after they confront a monster. Violet’s Music A little girl who loves music searches for people like her. Ruby Sings the Blues A loud girl learns how to control the volume of her voice through singing. With the smaller collection of electronic books from the International Children’s Digital Library, readers K-4th grade can explore cultures around the world. Several of the offerings are bilingual. 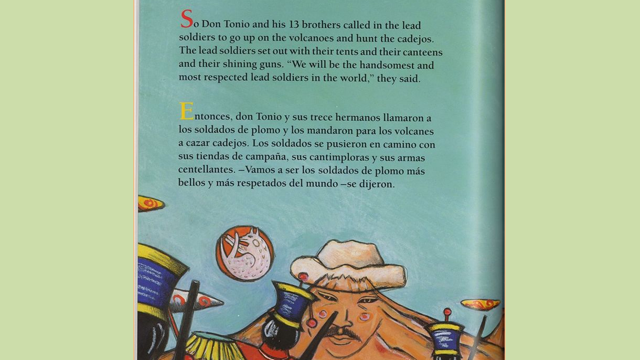 Magic Dogs of the Volcanoes The magic dogs that protect Salvadorean villiages are pursued by wicked soldiers. With the help of two ancient volcanoes, they triumph. Bilingual in English and Spanish. The Little Weaver of the Thái-Yên Village A young Vietnamese girl maintains her own cultural identity while struggling to adjust to America, Bilingual in English and Khmer. The Amazing Adventures of Equiano Trace the journey of a young African boy of the Ibo tribe, from his capture by Africans to his life in the Americas. This story was inspired by the memoirs of Olaudah Equiano. Bilingual in English and French. Reading level: 4th -6th grade.